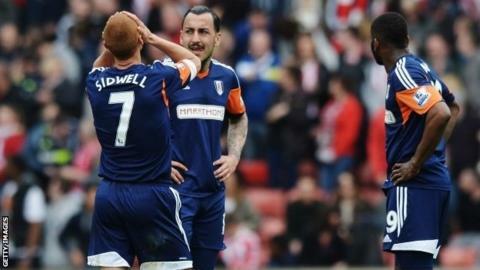 Fulham were relegated after a 13-year stay in the Premier League as they suffered a heavy defeat at Stoke. Felix Magath's team needed to win to keep alive their hopes of survival, with Sunderland's victory at Manchester United sealing their fate. Striker Peter Odemwingie tapped in Stoke's first, before Marko Arnautovic and Oussama Assaidi, who were both excellent, made it 3-0 after the break. Kieran Richardson scored for Fulham, before Jon Walters sealed victory. The Potters were as dynamic as their visitors were listless. Apart from Richardson's goal, Stoke keeper Asmir Begovic was barely troubled, and his team-mates must have felt like they were playing a pre-season friendly. Cottagers supporters will point to a change of ownership, three different managers and an unsettled side as the reasons for their team's struggles this season - but on Saturday, when the circumstances should have served as inspiration, the players simply did not deliver. Scott Parker was the only Fulham player who rose to the occasion, with fellow midfielder Steve Sidwell failing to provide any drive in attack and striker Darren Bent barely touching the ball. Magath, who replaced Rene Meulensteen with 12 games remaining, reiterated after the match he wants to remain at Craven Cottage - and his rebuilding task will begin after next week's game against Crystal Palace. As for Stoke, manager Mark Hughes has made his side as difficult to beat at the Britannia Stadium as they were under predecessor Tony Pulis. This was their 10th home league win of the season, a record only bettered by the top five. Hughes's Stoke arguably play more attractive football than Pulis's side did, and in Arnautovic and the on-loan Assaidi they have two brilliant attacking players. Either side of Odemwingie's opener from a yard, both players forced great saves from Fulham keeper David Stockdale. All three were involved in Stoke's second. Assaidi passed with the outside of his boot down the left wing before Odemwingie squared the ball for Arnautovic to slam high into the roof of the net. The third goal also came from a counter-attack. This time former Blackburn player Steven N'Zonzi found Arnautovic, who unselfishly laid the ball on for Assaidi to convert. Richardson crashed home a consolation goal for the visiting team before Walters latched onto Charlie Adam's pass, outpaced John Arne Riise and slid in the fourth. Match ends, Stoke City 4, Fulham 1. Second Half ends, Stoke City 4, Fulham 1. Attempt missed. Darren Bent (Fulham) right footed shot from the centre of the box misses to the right. Corner, Stoke City. Conceded by John Arne Riise. Foul by Pajtim Kasami (Fulham). Offside, Stoke City. Marko Arnautovic tries a through ball, but Jonathan Walters is caught offside. Corner, Fulham. Conceded by Marc Muniesa. Foul by Matthew Etherington (Stoke City). Attempt missed. Charlie Adam (Stoke City) left footed shot from outside the box is too high. Assisted by Marko Arnautovic. Goal! Stoke City 4, Fulham 1. Jonathan Walters (Stoke City) right footed shot from the right side of the box to the bottom left corner. Assisted by Charlie Adam with a through ball. Goal! Stoke City 3, Fulham 1. Kieran Richardson (Fulham) right footed shot from the centre of the box to the bottom left corner. Assisted by Darren Bent. Substitution, Stoke City. Jonathan Walters replaces Peter Odemwingie. Charlie Adam (Stoke City) wins a free kick in the attacking half. Foul by Steve Sidwell (Fulham). Substitution, Stoke City. Matthew Etherington replaces Oussama Assaidi. Ashkan Dejagah (Fulham) is shown the yellow card for a bad foul. Foul by Ashkan Dejagah (Fulham). Attempt blocked. Ashkan Dejagah (Fulham) right footed shot from the centre of the box is blocked. Assisted by John Arne Riise. Corner, Fulham. Conceded by Marc Wilson. Substitution, Fulham. Pajtim Kasami replaces Mahamadou Diarra. Goal! Stoke City 3, Fulham 0. Oussama Assaidi (Stoke City) left footed shot from very close range to the centre of the goal. Assisted by Marko Arnautovic following a fast break. Attempt blocked. Darren Bent (Fulham) right footed shot from the centre of the box is blocked. Attempt missed. Charlie Adam (Stoke City) right footed shot from the centre of the box is high and wide to the right. Assisted by Peter Odemwingie. Substitution, Stoke City. Charlie Adam replaces Stephen Ireland. Attempt missed. Kieran Richardson (Fulham) right footed shot from outside the box is too high. Assisted by Darren Bent following a corner. Corner, Fulham. Conceded by Geoff Cameron. Mahamadou Diarra (Fulham) wins a free kick in the attacking half. Attempt blocked. Marko Arnautovic (Stoke City) right footed shot from outside the box is blocked. Oussama Assaidi (Stoke City) wins a free kick in the attacking half. Attempt blocked. Kieran Richardson (Fulham) left footed shot from outside the box is blocked. Assisted by Darren Bent. Go to BBC Sport's Facebook page to view Saturday's Premier League photos.